The auto industry went through a big change in the 1950’s. Alternators replaced generators and 12 volts batteries replaced 6 volts units. This allowed the spread of radios, power windows, and many other comfort items, but today, another big change is needed. Today’s cars are at the limit of what’s possible with 12 volts systems. Cars have more and more accessories and electrical appliances. Power doors, hi-fi systems with more than a dozen speakers, navigation systems, DVD players, all those put a huge stress to the battery, especially during winter. Alternators have grown, up to 250 amps in some SUVs, and the world’s most luxurious car, the Rolls Royce Phantom has two alternators. This cannot go on forever. Cars need higher voltage. The problem is well-known, the world was only waiting for the first car manufacturer to go for it. 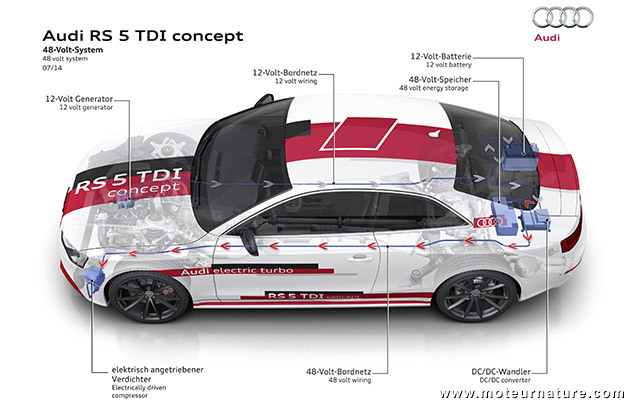 Several executives talked of 42 volts systems a few years ago, Audi will launch a 48 volts one. This will be an additional system. Lights and power windows will keep on using 12 volts, from a 12 volts battery, but there will be a larger 48 volts lithium-ion battery for the most energy-hungry equipments. Audi developed the 48 V technology with an electric turbocharger (illustration), but any system which needs a lot of energy could take advantage of it, like dynamic chassis control. Then, there’s energy recovery systems. Every Audi today comes with a smart alternator, which disconnects itself during accelerations but gets the most of the braking phases. This with 12 volts. At 48 volts, the gain would be much higher, and this is what Audi has in mind. Audi doesn’t give any date, nor does it say on which model it will use it, but the German company confirms it will use a 48 volts on a forthcoming model, and that’s great news. Other car manufacturers should follow this example.